Friday wasn’t quite a work day – had some admin to take care of in Newport first thing in the morning, but made it back to Mystic in time to take another ride with my lovely wife, who’s starting to ride. And was reminded again of why I love riding in rural Connecticut. 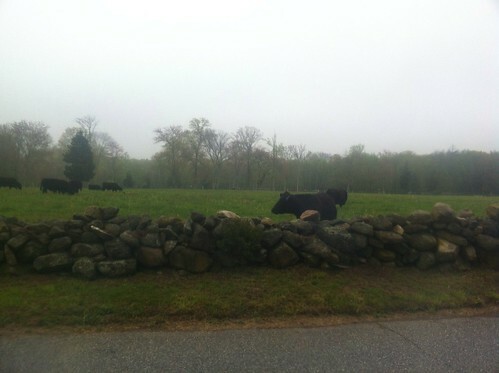 Out of the house, and within 20 minutes, we’re on thin, low-traffic two lane, surrounded by walls of Connecticut’s state flower, granite, and bucolic bovines. Rode easy for two hours, fog rolled in off of Fisher’s Island Sound, and back home to meet the kids after school. I threw in another 4 miles up to the top of the hill near the house. Feeling pretty good, but dreading the last long runs before Vermont City.